xLynx-CB is a high precision stepper and servo motor controller expansion board, powered by ARM Cortex-M3 based LPC1768 microcontroller. xLynx-CB is ideal for low power, high performance embedded applications. The board may also be used for any application other than motor control also. The board can simultaneously handle 6 servo motors, 2 Phi Robotics Lynx boards and 1 Phi Robotics Smart Lynx board. The board can be powered using USB or external 5V power supply.xLynx-CB is enabled with Phi Robotics Expansion Bus. It has SPI and CAN communication peripherals on the expansion bus. Phi Robotics Expansion Bus is a cross-platform stackable connector which allows user to build modular systems. Multiple expansion boards can be stacked on top of a base board to expand the system functionality. All the signals on the expansion bus are standardised to 3.3V. Base board expansion bus have 3.3.V and 5V supply lines to power expansion boards. 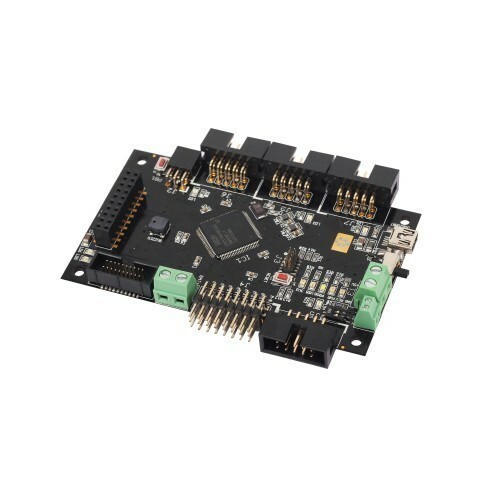 All Phi Robotics base boards and expansion boards comply with this expansion bus design.Phi Robotics Expansion Bus is a 10x2 pin connector having the following peripherals: UART, SPI, I2C, CAN, GPIO and external interrupts. All expansion bus peripherals are enabled on base boards, however on expansion boards only peripherals that are required are enabled.